With three shelves the Panama Solid Pine 1 Drawer Bookcase is an excellent compact way of storing and displaying your books and possessions. The Panama bookcase has a rustic look. With a solid design and a beautiful warm finish the whole Panama range has a welcoming appearance and fits in nicely with most decors and tastes. 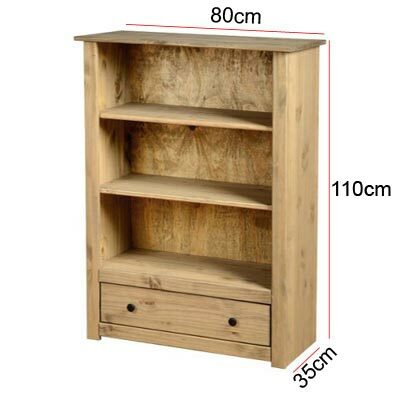 Constructed from solid pine the Panama bookcase is strong and sturdy. Finished with a natural wax to enhance quality and durability. Simply wipe over with a duster or dry cloth to keep a dust free surface. For trickier marks try a damp cloth before resorting to harsh chemical cleaners. This bookcase is delivered flat packed so self-assembly is required. Easy to follow step by step instructions are included but you will need to provide your own tools.